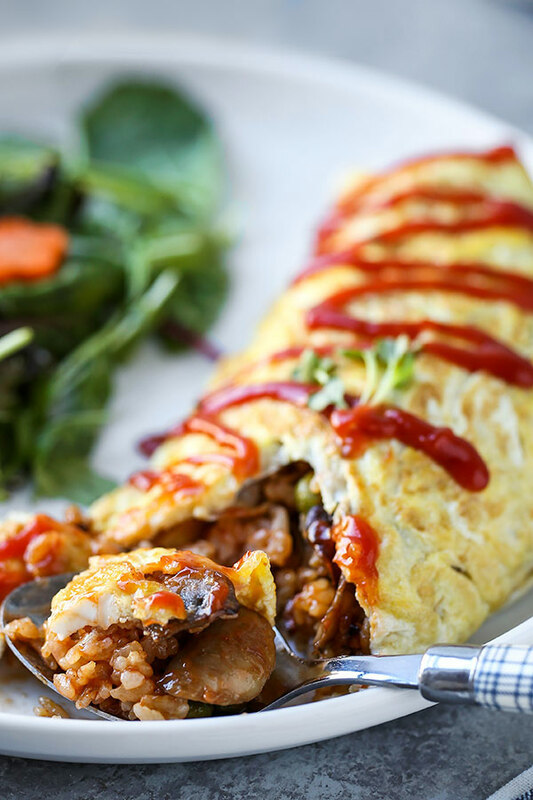 This Omurice Recipe is Japanese comfort food at its best! 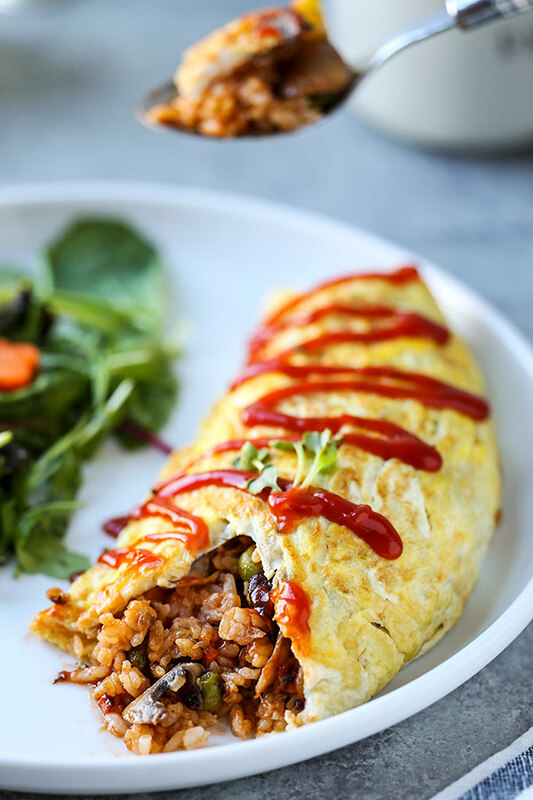 Ketchup flavored fried rice packed with veggies and served inside a fluffy omelette – it’s delicious! 20 minutes from start to finish. Oh, how we love omurice (Japanese omelette rice) here at our place! Whether it’s Saturday morning or Tuesday at 10pm, if I’m on the fence about what to make, I may just pull the trigger on this easy favorite. 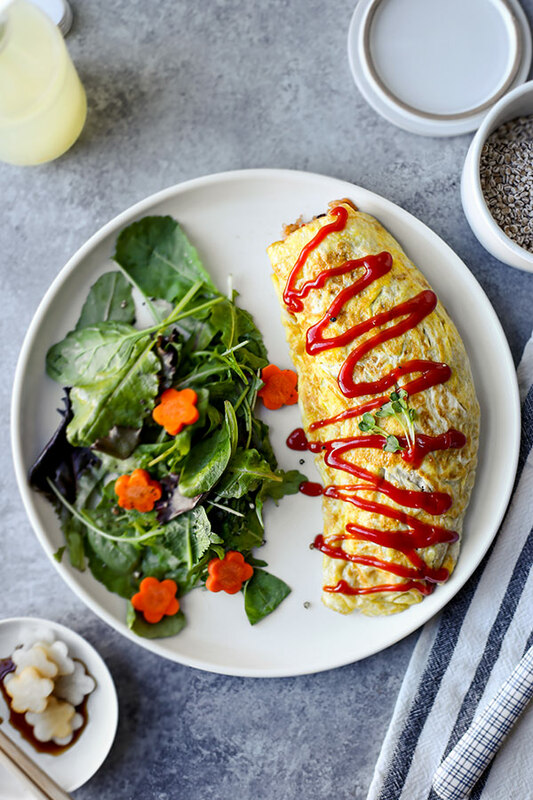 Omurice is one of those delicious standby recipes that is just so darn easy to make. 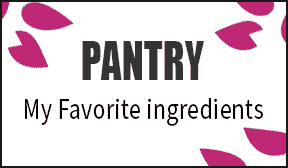 Even in an ingredients pinch, it works with just about anything. Bonus: making this Western influenced Japanese comfort food classic is also a FANTASTIC way to use up some of the leftovers in your fridge that may have otherwise gone to waste. Pulling phonetically from the two main parts of the dish, omurice (or more accurately OMU-RAISU – オムライス) is exactly what it sounds like. ‘Omu’ from omelette, and ‘raisu’: rice. 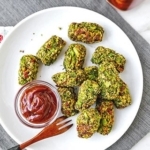 And like the name implies, the dish is a very simple mash-up: tomato flavored fried rice wrapped in a super fluffy omelette and (usually) topped with ketchup. For me, the ketchup is the most important part of this dish. 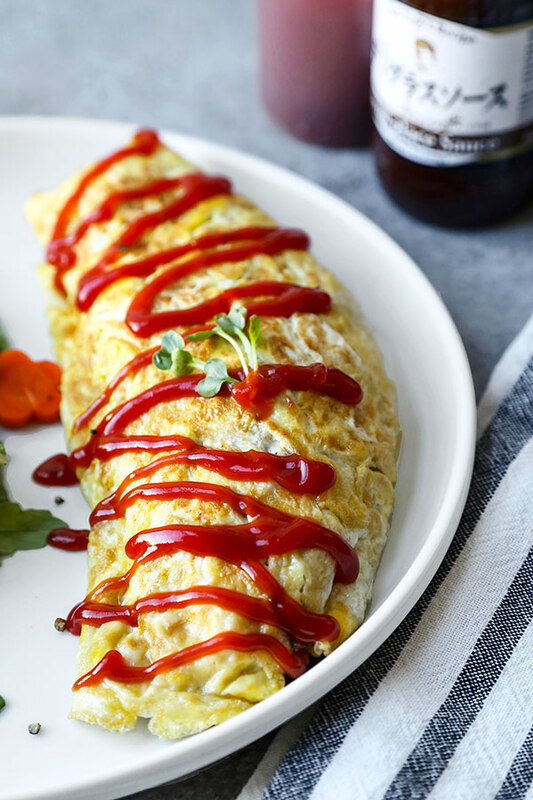 While you may find some places in Japan that serve omurice topped with demi-glace, we’re #teamketchup all the way at our place when whipping up this delicious treat! While simple to make (and simple to look at), it tastes amazing! I have been a huge fan of ketchup with my eggs since I was a little girl, drowning my scrambled eggs in red tomatoey goodness. The fried rice in omurice delivers a savory and hearty element to the fluffy, eggy exterior. 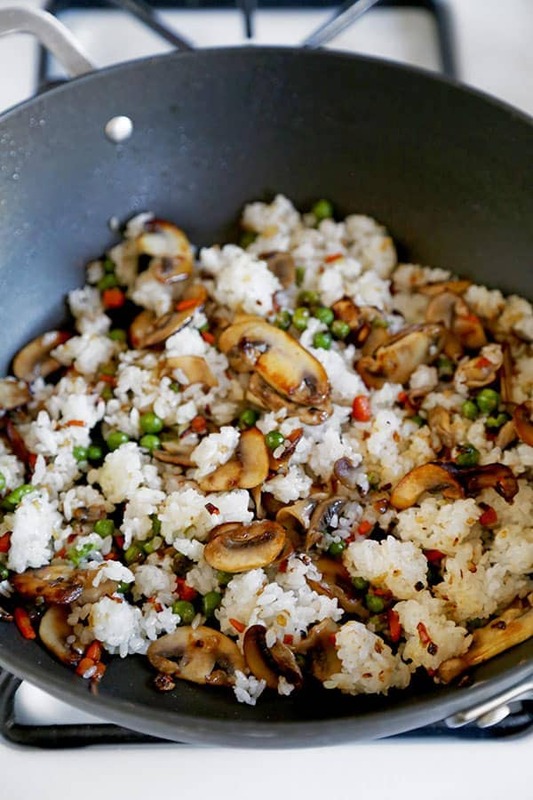 I usually add green peas for their verdant pop, and mushrooms for their natural, earthy flavor. If you decide on using meat in your own omurice recipe, Japanese Berkshire Kurobuta sausages can add an element of smoky fire to the mix. Top with ketchup, and the result is a Japanese omelette that’s a little smoky, spicy, sweet and salty. 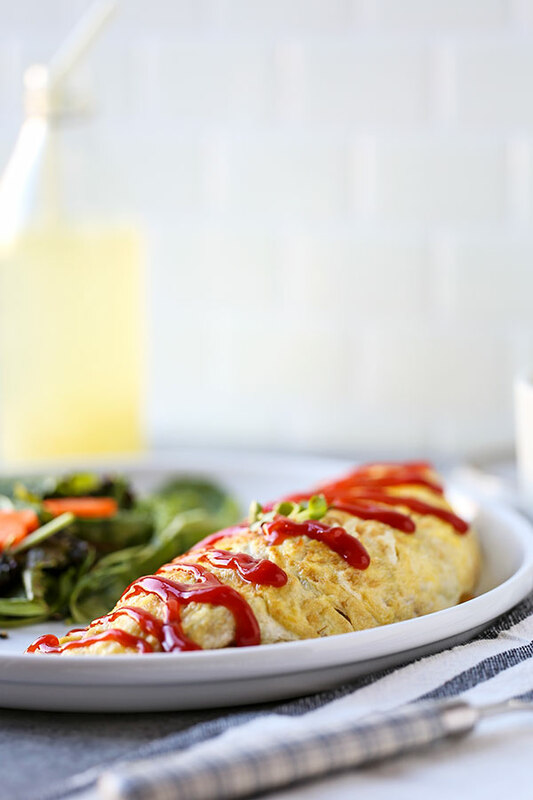 This omurice recipe is the quintessential kid friendly meal. It’s usually topped with an American flag in Japanese okosama lunches – which are kids-meals served in family restaurants in Japan. Oddly enough, while baked into Japanese culture the basic flavors of omurice skew quite American. 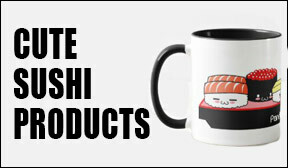 Is omurice Japanese or American? This type of Western flavored food in the Japanese cuisine lexicon is referred to as yōshoku – and is huge in Japan. An oversimplification if yōshoku is that it is food containing some Western ingredients and flavors, prepared in a style that appeals to the Japanese palate. 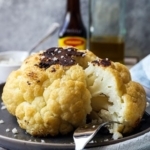 And those influences can be seen in many dishes ubiquitous in Japanese family eateries: like spaghetti Napolitan, many au gratin dishes – and even in Japanese korokke (croquettes). Not only is omurice a good family meal – but it’s also great for… wait-for-it… hangovers! Yep, omurice is filling comfort food that, much like a bacon-egg-and-cheese sandwich, can make a rough morning a little easier on the head. 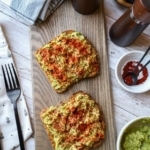 It’s one dish I recall ordering more than a few times off the breakfast menu at Denny’s in Tokyo – during those carefree days when staying out until the sun came up seemed like a normal thing. Lately, it’s more common that I make omurice at home while Ben and I post up in front of the TV, rooting for our favorite hockey team, or binge-watching Midnight Diner: Tokyo Stories. 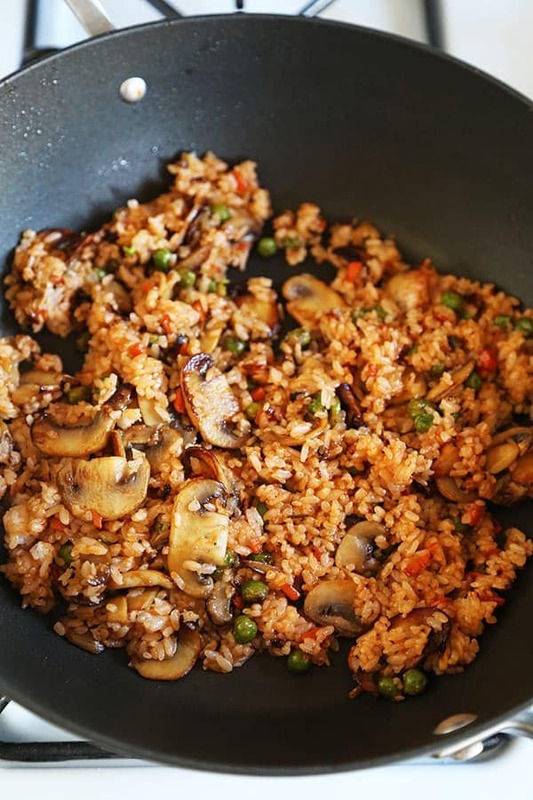 While every household tends to have their own favorite way to cook it, I prepare the fried rice first and set it aside so it’s ready to go when the eggs are done. I always deal with the eggs last. Why? Because, in my opinion, the omelette is the lynchpin that makes this entire dish work. It’s way too easy to overcook an omelette if it’s sitting around in a hot pan, waiting for the fried rice to finish up. I’m not big on overcooked eggs. I believe a fresh-out-of-the-pan omelette to be so much more pleasant to the palate! And if you find yourself with more fried rice than you can possibly ever stuff inside one omelette, just store the leftover rice for up to a few days in the fridge. Then, the next time the comfort food bug bites you, just zap the rice in the microwave. Make a fresh omelette on the stove – and you’re good to go! If you’re planning to serve it with sides, I’d suggest serving your omurice with a few healthier Japanese options such as oshitashi (boiled spinach with dashi and sesame), soy and sesame edamame, or savory nasu dengaku (broiled eggplant with miso glaze). Use your favorite ingredients in your own omurice creations! The best part about this fun omurice recipe is that you can use whatever is handy or sounds good at the moment. 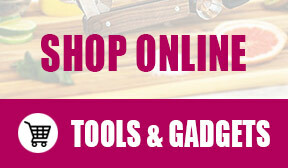 I have the most fun with ‘recipes’ that are a little open-ended and give you the freedom to improvise on the spot. 90% of the time, I top my Japanese omurice with ketchup. But you’d better believe that, during the other 10%, I’ll be experimenting with yummy toppers like Kewpie mayonnaise or barbecue sauce. Ketchup or no, Ben LOVES to drizzle a little soy sauce on top of his omurice. 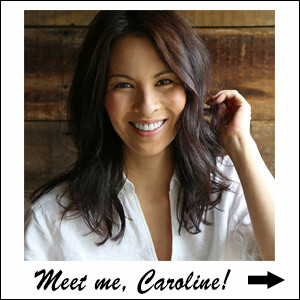 I like mine with chopped scallions and a squirt or two of sriracha. How about you? What’s your favorite omurice topper? Do you like ketchup with your eggs, or do you run for the hot sauce as soon as your eggs hit the plate? I’d love to hear about it in the comments section below! Did you like this Omurice Recipe? Are there changes you made that you would like to share? 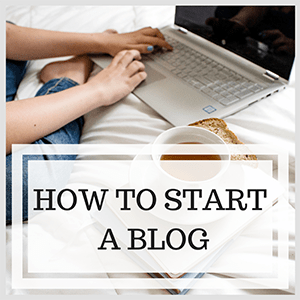 Share your tips and recommendations in the comment section below! Make this popular Japanese comfort food in 25 minutes and watch your kids devour it! Whisk ketchup and stock in a bowl and set aside. 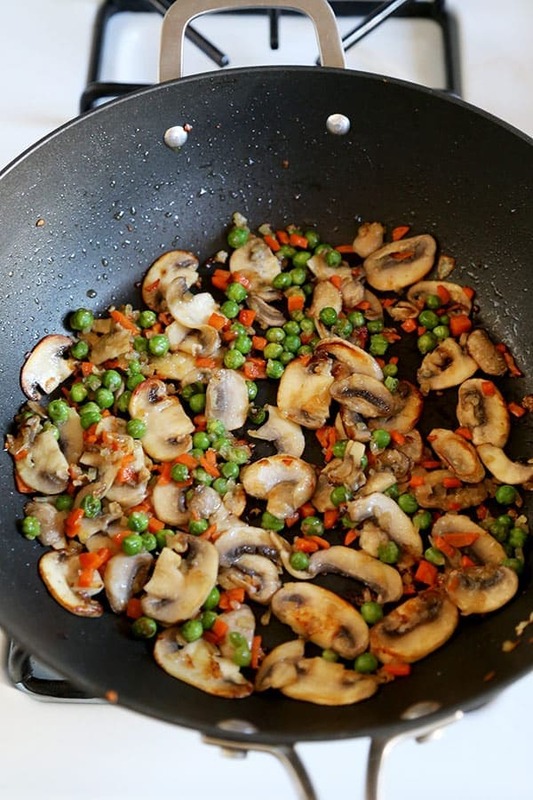 In a deep skillet over medium/high heat, add oil and mushrooms. Cook for 4-5 minutes, or until the water from the mushrooms has evaporated. 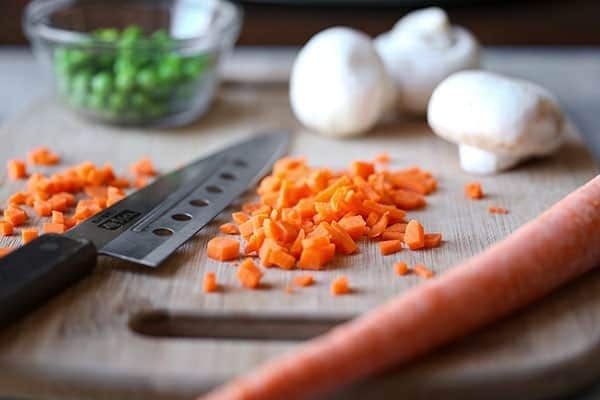 Add onions, carrots and peas and cook for 3 minutes, or until carrots are tender but still yield a soft crunch. Add rice and break it up using a plastic or wooden paddle. Mix well and add ketchup mixture. Mix well until the rice is evenly colored. Turn the heat to the lowest temperature and season with a little salt and pepper. In a separate mixing bowl, whisk 2 eggs and 1 tablespoon water. 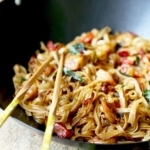 In a frying pan over high heat, add vegetable oil and swirl to evenly coat the bottom. When the oil is hot, add the egg mixture and swirl around to create a round omelette. When the omelette is mostly cooked (slightly runny top), lower the heat to low. Add half of the rice mixture in the center of the omelette and gently fold each side toward the center. It doesn’t have to entirely cover the rice, just enough that you can fold a little of the omelet over the rice. Place a plate on top of the pan (make sure it’s touching the pan, flat) and quickly flip the pan so the omelette falls onto the plate. Top with a zig zag ketchup pattern and serve. Repeat the same step for the second omurice omelette. 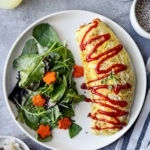 This Japanese omurice recipe makes one large omelette. Now this is how you eat an omelet. I make a Chinese style sweet rice omelet, but have never made the Japanese style. I’m going to have to try this one. I love fried rice but I never knew you could make an omelet out of it. Very Interesting. Looks delicious!